(a) A convex lens is making an image of a candle flame. (b) A concave lens is making an image of the flame. 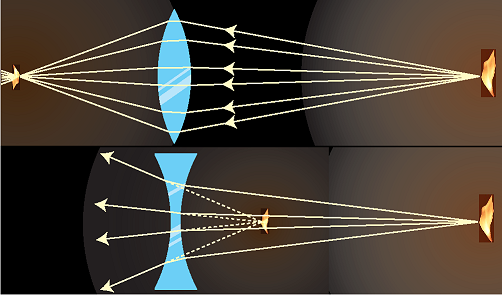 Figures (a) and (b) show examples of lenses forming images. There is essentially nothing for you to learn about imaging with lenses that is truly new. You already know how to construct and use ray diagrams, and you know about real and virtual images. The concept of the focal length of a lens is the same as for a curved mirror. The equations for locating images and determining magnifications are of the same form. It's really just a question of flexing your mental muscles on a few examples. The following self-checks will get you started. 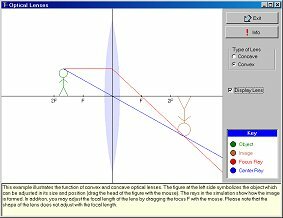 There's an interactive simulation available on the "Learning by Simulations" Web site which allows to experiment with various lenses and different focus lengths. Self-Check (1) In figures (a) and (b), classify the images as real or virtual. Answer In (a), the rays cross at the image, so it is real. In (b), the rays only appear to have come from the image point, so the image is virtual. Self-Check (2) Glass has an index of refraction that is greater than that of air. Consider the topmost ray in figure (a). Explain why the ray makes a slight left turn upon entering the lens, and another left turn when it exits. Answer A ray is always closer to the normal in the medium with the higher index of refraction. The first left turn makes the ray closer to the normal, as it should be in glass. The second left turn makes the ray farther from the normal, which is how it should be in air. Self-Check (3) If the flame in figure (b) was moved closer to the lens, what would happen to the location of the image? Answer Take the topmost ray as an example. It will still take two right turns, but since it is entering the lens at a steeper angle, it will also leave at a steeper angle. Tracing backward to image, the steeper lines will meet closer to the lens.